With most cameras coming with their own strap when you buy them, you might be forgiven for asking why anyone would want to buy one. But the one that you get for free from the camera manufacturer, is likely to be pretty basic, and emblazoned with the brand name in big lettering. The Matin Neoprene Comfort Strap offers the winning combination of comfort and flexibility. Based around a thick and highly flexible neoprene neck pad, which stretches slightly to better suspend a heavy load, Matin’s entry gets top marks for value. A textured rubber coating on the underside adds comfort and is easily cleaned. 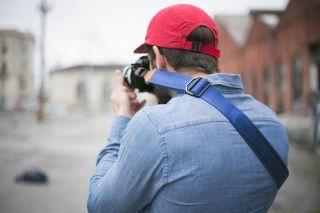 Two quick-release clips mounted close to your camera leave unobtrusively short sections of strap attached if the neck piece is removed, and these can be joined to form a compact hand strap. Does the quality cushion the price? A sling, shoulder and neck strap in one, the Slide exudes quality with a seatbelt-style strap and premium fittings, which include clever quick-release buttons to detach the strap. This is far from the most compact strap, though, making it tricky to squeeze into a tight kit bag. While it’s billed as a strap for binoculars, this neck strap will attach to a camera equally easily. Its unique feature is a breathable, stretchy and very flexible neck pad. It also folds small and can be detached quickly, but the price still seems high next to the Matin strap. This well priced strap features a 6cm-wide neoprene neck pad that really spreads a load, although its square-cut edges can rub. Two clips will detach the pad, leaving the connected ends able to join and form a hand strap, albeit one that’s on the long side. It’s the most compact strap here, but that’s down to a narrow design that’s no wider or more comfortable than a standard neck strap. A grippy coating on both sides lets this double as a shoulder strap, and extra hardware can connect it to backpack straps.